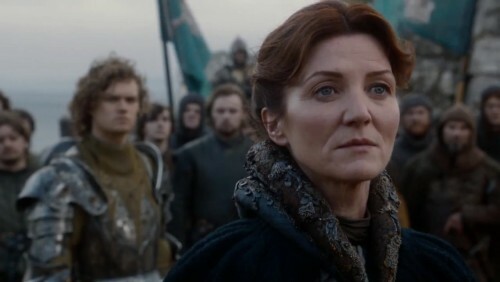 Catelyn Stark presenting herself to King Renly, probably, with Ser Loras Tyrell, the Knight of Flowers, and Renly’s followers behind her. Loras’s armor is apparently new or updated in some fashion, and certainly looks very impressive, pretty much as rich and ornate in appearance as what Martin describes for the most famed young knight in the Seven Kingdoms. Also, one may note Loras’s hair looks rather different—that’s because it’s Finn Jones’s own hair, rather than a wig as last season.